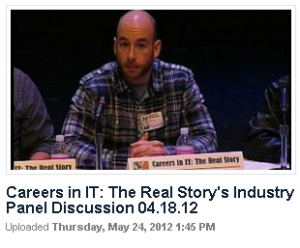 This year’s Careers in IT: The Real Story’s IT industry panelists unexpectedly had a lot in common. Almost all of them were computer science majors in college. As such, they had not only strong on-the-job experiences; advice to share, as well as how to go about finding a job, but great insights into what courses were valuable, how best to study, why in any economy most IT professionals can find employment, what is the best programming language to start with, and what their college experience was like. Click on the image to your left to view the video.